Cheshire Polythene Film Company Limited was established in 1982 to supply Low Density Polythene film on the reel to all aspects of British Industry. The primary aim was to fill demand for order levels of 200kgs upwards for both general packaging and shrink-wrap film customers. Since its’ inception further extruders have been added plus equipment to produce both shaped tear-off garment bags and straight seal bags on the roll. Certain film types can also be supplied printed with a simple safety warning notice. It is our aim to provide a quality product, backed up by a speedy delivery and administration service. We are in easy reach of the North West motorway network, giving a direct link to all parts of the country. Delivery is either by our own unmarked vehicle for local areas or on reputable long established carriers for other locations. Film supplied on behalf of distributors/merchants can be delivered direct to their customers using either plain or own delivery notes. No mention of CPF is on any paperwork. We are fully accredited to ISO 9001:2008. All our polymers and master batches are produced by the major suppliers and comply with all current legislation. As we are not involved in converting to individual bags or printing, all our efforts are directed to the production of quality films and their distribution. LDPE film is still a relatively inexpensive method of packaging most goods that need to be transported. It is extremely light and, as a result, adds very little to the weight of the product. As a result, transport costs are kept to a minimum compared to certain other packaging mediums. 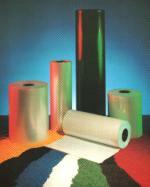 All films that we supply can be fully recycled.